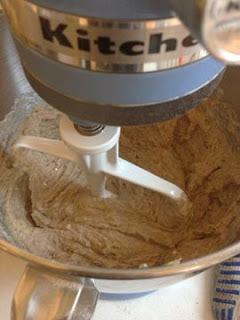 I make a lot of "quick breads." I try to always have banana bread or blueberry bread in the freezer for a quick breakfast. 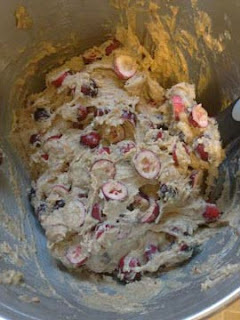 Blueberry bread is just blueberry muffins without the worry about whether they'll come out of the tins properly. 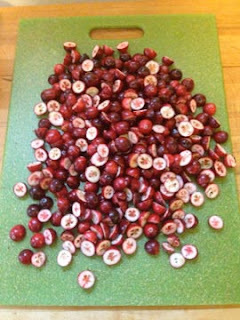 I buy extra berries in the summer and keep them in the freezer for as long as I can stand it. I keep whole bananas with their skin on in the freezer (stash them just when they're too brown to eat raw). But sometimes, the season catches up with you and you're out of nanners and blueberries and you're *so over* things like pumpkin and apple. What then? 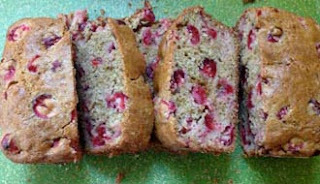 Cranberry bread. 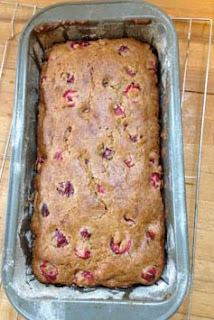 Cranberry orange bread. Seasonal, but not squash. 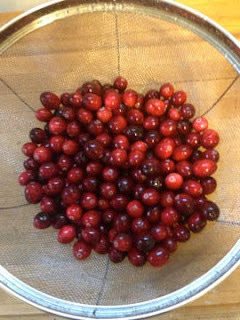 I started with two cups of fresh cranberries. 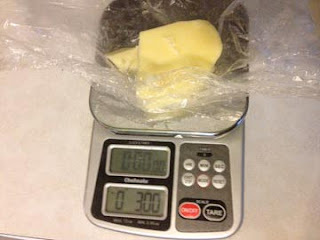 I melted 3 oz of butter, which is about a third of a cup. Oh, and preheated the oven to 350. I swished the butter around my unphotographed loaf pans to grease them, then put it in a bowl with 3/4 cup orange juice and 3/4 cup milk. This was whisked together with three eggs and somehow, none of this is photographed, but in the end it looked like this and I set it aside. 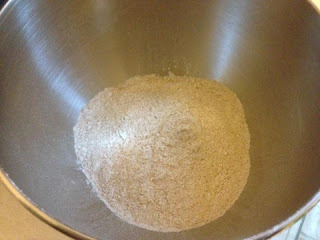 Then 3 cups flour - 2 cups whole wheat and 1 cup AP. 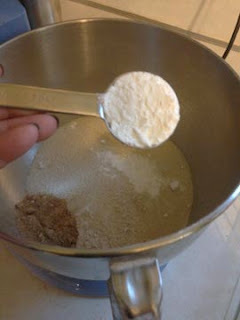 1 cup white sugar and 1/4 cup brown sugar. You could do all white, but I like what brown adds. Plus a teaspoon of baking soda. And mix the dry goods together. Then I zested my orange (from the juice) into the bowl - I might have gotten a tablespoon of zest. More is better. This didn't photograph. 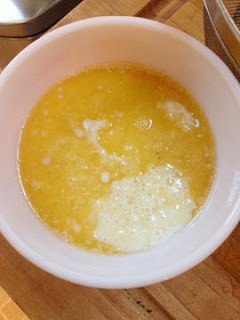 Stir the eggs/milk/oj/butter mix in. At this point it might be a little curdly looking with the oj and milk, but that's ok. Mix well. 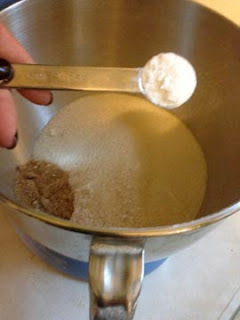 Pour it into two loaf pans and smooth it with a spatula. Into the oven for 50-60 minutes. I make one loaf to freeze and one loaf to eat, and then quick and homemade breakfast is always just a defrost away. 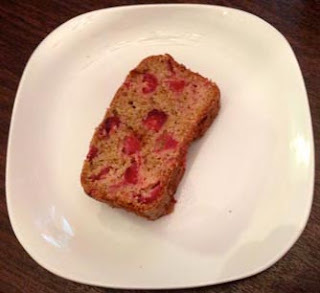 Tart and a little bit sweet (just a little) this quick bread means happy breakfasts in the cold months. 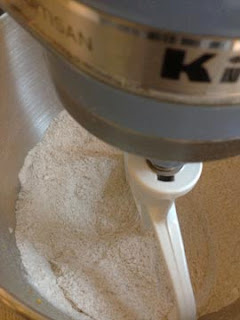 Mix wet goods and dry goods separately, then together. 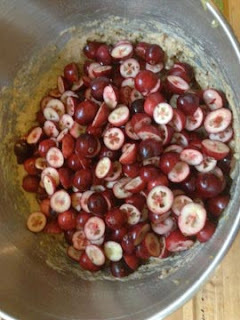 Add cranberries and mix well. Bake at 350 for 50-60 minutes. Cool, then slice and serve or freeze.